If you’re an Office 365 customer, install the latest updates that are available today to resolve the issues. Go to File > Office Account > Update Options > Update Now. "The program used to create this object is Outlook. That program is either not installed on your computer or it is not responding. 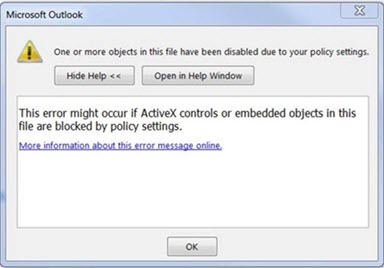 To edit this object, install Outlook or ensure that any dialog boxes in Outlook are closed". “This item contains attachments that are potentially unsafe. You may not be able to view these attachments after you close them”. Forward the email to yourself and then open the attachments from the forwarded email. Change the email format to HTML, or Text format. Drag and drop the attachments to your desktop. Go to File > Save Attachments. Copy and paste the attachment to your computer. When opening an attachment that includes consecutive periods (...), or an exclamation point (! ), the files are blocked and you receive an Opening Mail Attachment warning. Or if an email message includes an attached email message, and the attached email message's subject line ends with an unsafe file name extension as listed in the Blocked attachments in Outlook, the email attachment will be blocked for recipients. If you’re an Office 365 customer, install the latest updates to resolve the issues. Go to File > Office Account > Update Options > Update Now. 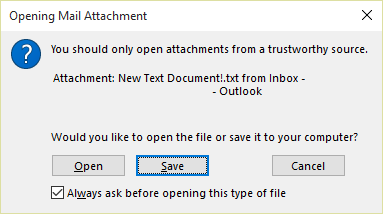 If you get the Opening Mail Attachment warning, and you're sure the attachment was sent from a trusted source, proceed to Open or Save the attachment. If the file is blocked because of a potentially unsafe file extension, ask the sender to save the email message to their computer and rename its subject line so that it does not end with an unsafe file name extension. Then, attach it to the email message and resend. Warning: Typically, Level 1 attachments are blocked. If you have enabled this policy, users can see Level 1 attachments in Outlook. If you use any of the workarounds to open the files, please make sure they are safe to open. See: Information for administrators about e-mail security settings in Outlook 2007. If you set ShowLevel1Attach to allow Outlook to display Level 1 attachments, and you send an email with an attachment you may see this message: "This item contains attachments that are potentially unsafe. 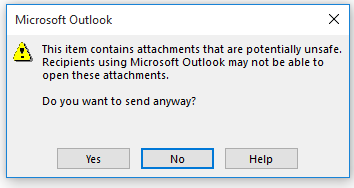 Recipients using Microsoft Outlook may not be able to open these attachments." If you’re an Office 365 customer, install the latest updates to resolve the issue. Go to File > Office Account > Update Options > Update Now. Note: A frame is a part of a web page or browser window that displays content independent of its container. A frame can load content independently.